The Whistler Blackcomb Foundation and Whistler Museum & Archives Society are offering the chance to own a piece of Whistler's mountain history this Feburary with the sale of trail signs from both Whistler and Blackcomb Mountains. 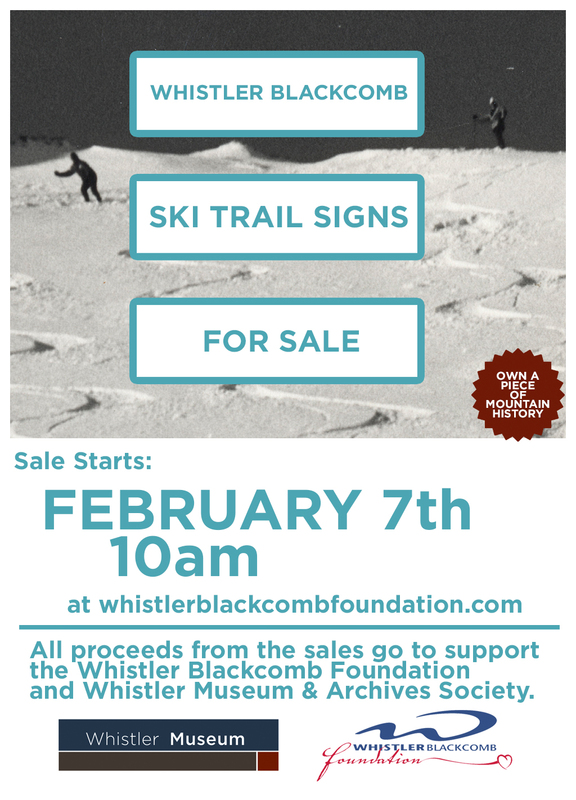 Over 250 unique signs will be available for purchase online at whistlerblackcombfoundation.com Thursday, February 7 at 10 AM PST. These signs previously directed skiers and boarders down their favourite runs and include a variety of trails, lifts and logos. Whether you favoured Jimmy's Joker or Pony Trail, there's sure to be a sign to bring back memories of days spent in the snow. Signs range from $20 to $250, depending upon condition. Purchased signs will be available for pick up at the Whistler Museum Feburary 9, 10 & 14 only. All proceeds from the sales go to support the work of the Whistler Blackcomb Foundation and Whistler Museum & Archives Society. A selection of signs will be retained in the Whistler Museum's artifact collection. The Whistler Blackcomb Foundation is dedicated to providing financial support to registered non-profit organizations whose activies provide benefit to residents of the Sea to Sky Corridor in the areas of health, human services, education, recreation, arts and culture and the environment with an emphasis on children, youth and family programs. The Whistler Museum & Archives Society works to collect, preserve, document and interpret the natural and human history of mountain life - with an emphasis on Whistler - and to provide a forum in which to present an innovative range of exhibitions and education programs to enrich the lives of residents and guests.